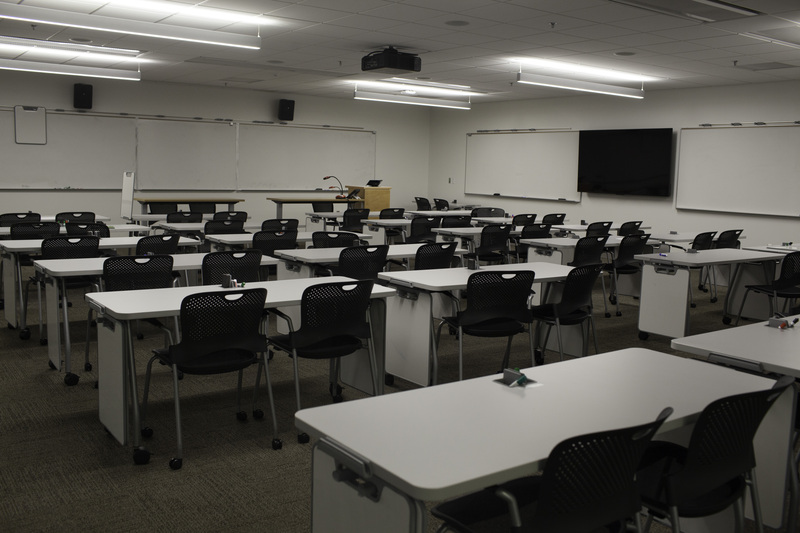 The Price Science Commons has two classrooms suitable for use for credit classes. 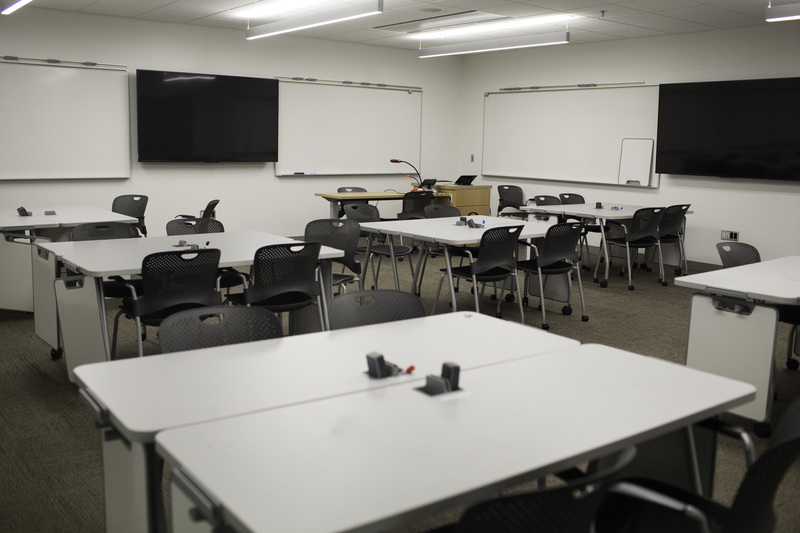 These rooms were designed for flexible, active-learning instruction, and are scheduled through the Price Science Commons manager. You can find out about already-scheduled events and whether the space might be available by visiting the calendar, which shows both rooms on one grid. Mouseover to see when events end. Our scheduling system is not on the same timeline as the Registrar's. We check with the Science departments in the middle each term for instructors who use active-learning techniques heavily, but have classrooms assignments for the next term which don't support this as well as ours could, and collect requests to use our space. Shortly before registration commences, we take all the requests and work out which we can fulfill in a way that maximizes use of the space. Some of the factors we may consider include class size, active learning techniques employed, previous use of the space, and schedule which allows the greatest use. The form to schedule the space for an upcoming credit class is available here; filling it out earlier than we check with the departments will have no effect on prioritization. Completed forms can be returned to the manager. We regularly get requests for space uses which include club/group meetings, midterm or final review sessions, public talks and workshops, terminal project presentations, or other one-time or few-time uses. While these are not inappropriate uses of the rooms, they are a lower priority than the instructional uses for which the rooms were designed. Therefore, we'll need to wait until classes are scheduled into the space, so requests will generally only be considered once the previous term is winding down -- for example, requests for spring would be considered starting around finals week of winter term. 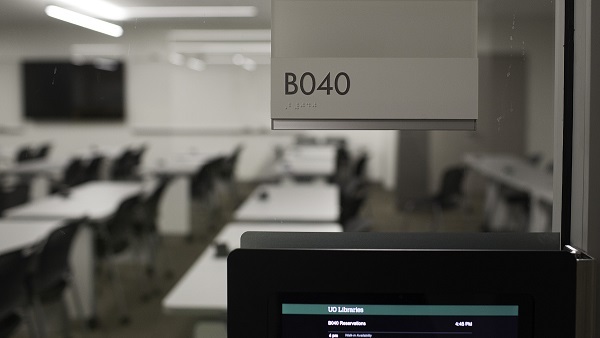 In general, we will approve uses that are single-instance and are fundamentally associated with university and library values and with the sciences overall; in general we will not approve uses which would be for-profit or which would be better suited to group study rooms. Club meetings will be considered on a case by case basis. In order to request space, you can use the ad-hoc use form, here, and submit it to the manager. Seating: seats 58 at flexible tables usually arranged in 'pods' of 4-6 seats. 58 is a maximum; 52-54 is more comfortable. Display: one projector with screen; two additional large-screen monitors on the two walls adjacent to the one with the screen. Can display different outputs on each screen. Controls: Crestron control for laptop, document camera, blu-ray player. Multiple connection options available in room (or, we have a variety of adapters at the service desk). Laptops: 12 Dell laptops available for UO users; instructors may check out keys to gain access. Software may not be loaded onto laptops. Doors: There are two doors into the library, and one into the stairwell. The door into the stairwell is an exit and may not be propped open. Other: whiteboards on all walls; individual whiteboards at tables which can be displayed a variety of ways. Seating: seats 28 at flexible tables usually arranged in 'pods' of 4-6 seats. Again, 28 is a maximum; 25 is more comfortable. Display: two large-screen monitors on two adjacent walls. Can display different outputs on each screen. Laptops: 8 Dell laptops available for UO users; instructors may check out keys to gain access. Software may not be loaded onto laptops. Other: whiteboards on all walls; individual whiteboards at tables which can be displayed a variety of ways. Glass walls on significant portions of two sides.